A return of winter weather early Wednesday morning kept emergency crews running from one accident scene to the next on I-90. Among the crashes was one involving a Stillwater County Sheriff’s deputy, who was rear-ended while in his patrol car while providing traffic control for a different crash. At 9:12 a.m., Deputy Ren Crain advised dispatch that he had been rear-ended between mile marker 411 and 412, according to dispatch records. 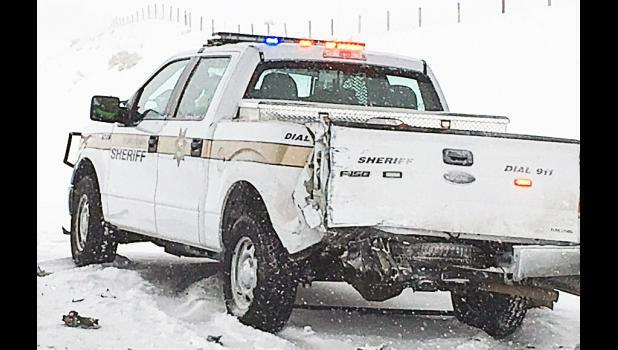 Crain’s Ford F-150 patrol truck was stationed in the driving lane on top of a hill providing traffic control for an accident below, said Montana Highway Patrol Trooper Shane Warehime. An eastbound pickup truck in the driving lane tried to pass a semi on the right, hit the deputy’s truck, then spun in front of the semi, and was struck by the semi, said Warehime. The driver of the pickup truck declined medical treatment and was cited for failing to move over for a stationary emergency vehicle and driving too fast for conditions. Crain was taken to the Stillwater Billings Clinic by ambulance and released later in the day. Undersheriff Chip Kem said Crain avoided serious injury, but was very shaken up by the incident. Kem urged drivers to be mindful of road conditions and the presence of emergency crews working several scenes. State law requires motorists to slow down and move to the opposite lane of traffic wherever emergency crews are working. MHP, deputies, Columbus police, Columbus Fire Rescue and Park City fire and ambulance responded to multiple accidents along the interstate throughout the day on Wednesday, Jan. 10. Several involved semi trucks that required heavy wreckers being called in. Early in the morning, two semis spun out in the eastbound lane of I-90 near Columbus, blocking one lane, according to the Montana Department of Transportation (MDOT). Increasingly heavy snowfall in the area began at approximately 7 a.m. The National Weather Service issued a Winter Storm Warning that was in effect until 11 p.m. Wednesday, Jan. 10. Snowfall and difficult travel conditions were expected, with accumulations of 4 to 6 inches of snow. Before the snowfall picked up Wednesday morning, road conditions from Big Timber to just east of Reed Point were classified as snow and ice-covered, and slush and scattered slush from Reed Point to Park City, according to MDOT. By 2 p.m. Wednesday, snowy and icy roads were in place from Livingston to Laurel. Wind gusts as high as 40 mph were forecast for Columbus, Absarokee, Park City and Rapelje, with wind chill as low as 20 degrees below zero, according to the National Weather Service (NWS). NWS issued a Hazardous Weather Outlook for Thursday night and Friday morning, when a weather system is expected to bring a chance of accumulating snowfall and difficult travel conditions. Friday will see a high of 18, a low of 10 and a 40 percent chance of snow. Saturday and Sunday highs will hit the upper 30s.